The Croaking Gourami originated from shallow puddles in southeast Asia. It is also known as the Talking Gourami because of the clicking noise it can make. It is closely related to the much smaller Sparkling Gourami. Sparkling Gouramis aren't particularly colorful, but there is a great deal of variability, ranging from green to dark purple with black or red spots on the fins. Sometimes there are bands of dark spots along the lateral line. It does have a long thread-like pelvic fin, which is typical of gouramis. Croaking Gouramis are a good community fish, but males can be quite territorial toward each other, especially during breeding. In order to reduce aggression groups of more than 3 with more females than males are recommended. The tank should be well planted and have hiding areas of rocks or driftwood, as Croaking Gouramis are a fairly timid species. Similar to the Betta and other anabantids, the the Sparkling Gourami is a labyrinth fish, which means it can breathe air directly and will frequent the top of the tank. Sparkling Gouramis can survive in poorly oxygenated water. They will eat flake food, algae flakes, pellets, frozen brine shrimp, frozen bloodworms and tubifex. They will benefit from occasional live brine shrimp. In the wild they eat fruit flies, water fleas and mosquito larvae. The Croaking Gourami is compatible with Bala Sharks, Clown Loaches, Corydoras, Danios, Gouramis, Hatchetfish, Harlequin Rasbora, Kuhli Loaches, Liveberarers, Ottos, Plecos, Rainbowfish, Rainbow Shark, Red Tailed Shark, White Clouds. The Croaking Gourami is not compatible with Cichlids. Males are difficult to distinguish from females. 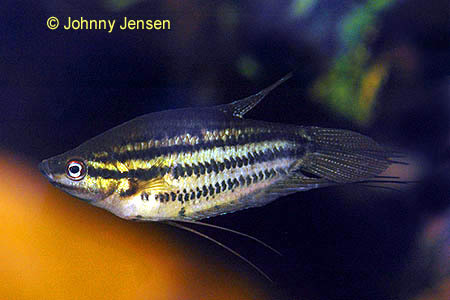 Males may have a more pointed dorsal fin and show intensified color during breeding. Breeding is best accomplished in a tank of about 20 gallons. When they are ready to spawn, the male builds a bubblenest under leaves at the surface and then dances and wraps around the female. The male ensures the rising eggs reach the bubblenest. The spawning process can be repeated several times over a number of hours. Between 30 and 200 eggs can be produced. The female should be removed after spawning. The male will guard the nest and young fry. The fry hatch in a couple of days. The male should be removed when the fry swim free. The fry should be fed infusoria and then brine shrimp.